Flyers are a means of communication, flyers are art objects, and as a new book out now via Drag City explains, they can also tell a rich social history. 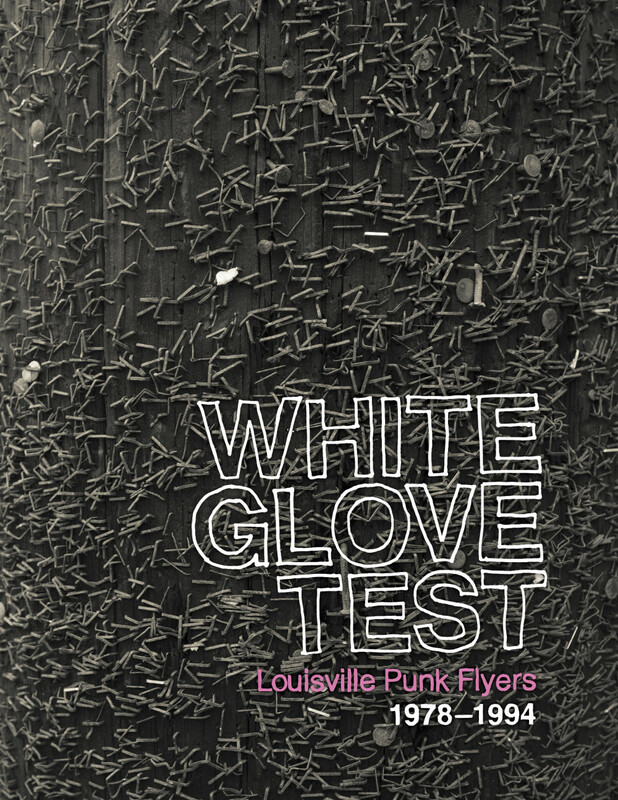 White Glove Test: Louisville Punk Flyers 1978–1994, released in April, is a full-color hardcover book, compiled by a team of six editors who have collectively spent decades embedded in the Kentucky town’s punk community. Through 288 pages of flyers, organized chronologically, the books offers a narrative of the city’s evolving do-it-yourself scene, a tight-knit corner of the U.S. underground that’s trajectory is both unique and universal. While the book paint a picture of the artists, venues, and music culture of Louisville, it also speaks more broadly to the ways like-minded folks used primitive forms of social media to connect in a pre-internet underground. As an art book, White Glove Test — first published this spring in conjunction with a related exhibit at the Kentucky Museum of Art and Craft — is an interesting look at the ways the visual culture of punk works as an extension of the music itself: how the flyers can look scrappy when the music is screechy, the lines more precise as the sound grows mathematical. It charts the evolution of styles from the years when options for punk flyers were limited to stencils, spray paint, and rub-off letters, to the early days of desktop publishing and graphic design. Surrounding the publication of White Glove Test—the name comes from a song by Louisville legends The Endtables—we spoke with Driesler about the book’s goals, how flyers help reclaim public space, the difficulties of archiving problematic histories (there is some imagery throughout the book that thankfully would not fly on the internet in 2015), some of his favorite Louisville artists, and the Internet’s general influence on spreading information about shows. You have a New York number. Did you used to live here? That’s the typical trajectory from a town like Louisville. I’ve lived in a bunch of places including Chicago and Portland, Oregon. Honestly, when I left Louisville I didn’t think I would ever live there again. But life will surprise you. Things happen that you never expect. At first it was a bit of an adjustment. I kept looking at Louisville and seeing all of the ways it wasn’t Portland or New York. It’s a complicated place to be from because in a sense the past is always there. People here have typically been here for a really long time and have fixed notions of people. It can feel constricting at times. I finally just decided to get to work, and realized there were projects like this flyer exhibit that could be done. Not to say I’m responsible for starting it by myself. There were six members of the projects. But the advantage of just leaving and coming back gave me the vantage point of seeing the value of things like this. I felt that it was really interesting as social history. If we did it right, even for people with no familiarity with the bands themselves, the story of White Glove Test could be the story of any mid-size city in that pre-internet era and how kids found each other through music and underground press. In the introduction you also explain it as a social history. When you look through this book, what is the “history” you see it telling? Beyond telling local music history, I think there are two other important stories that we set out to tell. One is the way that kids in the underground music found their ways to each other in the 1980s and a certain point of the 90s, prior to the internet. I went to my first punk show because I learned about it from a flyer, and that’s a popular story everywhere. I found my way to people, and found my best self to this day, and found the way to a community through music, and the flyers were one of the ways to find music. And then also, the evolution of flyer design from essentially making them by hand, or using rub off letters, to the beginnings of desktop publishing and computer design. If we did it right, even for people with no familiarity with the bands themselves, the story of White Glove Test could be the story of any mid-size city in that pre-internet era and how kids found each other through music and underground press. There was originally going to be an oral history component, which was scrapped in favor of just showcasing the flyer art. It seems like over the past few years there has been a heightened interest in punk aesthetics specifically, and the visual culture of punk. There have been a lot of punk art books coming out lately. When you decided to focus the book on the aesthetics and design of flyer art, were you thinking about any of those bigger conversations? There is an element of coincidence. I’m certainly aware of a lot of the books that have been published on punk aesthetics in recent years and own many of them. Fucked Up + Photocopied is a really excellent book about punk paper ephemera. Punk: An Aesthetic is really impressive. I think in a sense I did feel like the time was right. I’m not sure, for some of my co-editors it may have been more of a fortunate coincidence. I do feel that there’s a real interest of return to aesthetics of that era for inspiration and study I suppose. Enough time has passed from the original material in the book, for example. Not to suggest there isn’t a continuum from then to now, because I do believe there is. Your background is in writing and visual art. Did you make any of the flyers in the book? I did. There are some I made in the book. What I’m not is a musician. I was in a couple of bands for about five minutes each and I was at tons of these shows, and a lot of people in these bands were my best friends at the time, and remain good friends until this day. The punk rock community of Louisville had an incredible impact on the person that I turned out to be. I feel entirely informed by it, but I was not as active a participant in it as some people. I didn’t make as many flyers as a result. But something I think is interesting about flyers is that there’s a real democratic process to flyer-making. No one has to ask to make a flyer. There were flyers in the book made by people that were not in any of the bands, who were just excited and wanted to participate and be a part of what was happening around them. That was a way they could express themselves, if they had a talent for design and visual art. I made flyers for bands I wasn’t in. Sometimes as a favor but other times because I was just excited to be part of something, be part of the community. Do you have any favorite punk artists from Louisville? Or ones that have been overlooked? It’s hard to know where to start. There always have been a lot of really great bands here. There’s a cool band here now called Asm A Cik. There’s a band that a friend of mine’s daughter just started with some of her classmates, they are all like sophomores in high school and have a really awesome band called Sorry Mom. There are a lot of flyer makers. Almost everyone in the book, except maybe one person, is unknown outside the Louisville music community. That’s the way it goes all over the place. There’s an artist Matthew Ronay lives and works in Los Angeles now. He’s a very successful visual artist; he was in a band called Telephone Man that’s in the latter years of the book, as well as a couple of his flyers that I think are really beautiful and striking. Tim Furnish, who designed the book and made a lot of bold, high-contrast black and white flyers in the latter years of the book, primarily for his band Crain. I think he has a really distinctive, unmistakable style. There’s a real democratic process to flyer-making. No one has to ask to make a flyer. There’s a guy named Bruce Witsiepe from the early years who was in Louisville’s very first punk band No Fun. In New York he later started a band called Circle X that was on the fringe of the no-wave scene, they don’t really sound like a no-wave band. They moved to France and put out an EP that’s pretty incredible and nobody’s heard. Bruce made this really amazing art box called Anti-Utopia that was largely collected by museums and galleries in the late 1980s through the 1990s. Circle X kind of resurfaced around the same time and put out a record on Matador, and then unfortunately he got sick and died around then. He was an incredible visual artist. There are a quite a few examples of his flyer making in the book. What are some of the enduring challenges of being involved in punk in a place like Louisville? Particularly in the era we focus on in the book, there was something limiting but ultimately empowering about being in a smaller, more isolated community like Louisville. Because it was hard and there was a limited flow of information in the pre-internet era. Somebody would go on vacation with their family to Washington DC or New York City or Vancouver and they would come back with a couple of records, maybe a couple of fanzines, maybe a book or two, and it was like, the news of the world. People would borrow the records and tape them. We would all get together and listen to them, borrow the zines. In some ways the isolation really worked in favor of bands from Louisville. You were operating in a void in a lot of ways. That became less and less true as punk bands developed touring circuits, and more bands started touring the whole country. That’s illustrated in the flyers, you can see bands like Nation of Ulysses or Bikini Kill coming through town a few times per year. And then bands from Louisville would then go through DC and play with those bands and friendships and relationships were forged in that way. But for a long time not a lot of touring bands made it to town. And we kind of had to make our own fun. I enjoy the idea of flyers as art objects, when people put a lot of time and energy into them. I love flyer art. While flipping through, though, I couldn’t help but think about how cool it is that so much more information about a show can be communicated now. If punk is supposed to be about inclusivity, with social media you can reach more people, you can include more information, your contact info, the venue’s accessibility information. At the same time, it’s a lot easier for underground cultures and cultures of dissent to be surveilled upon because of the internet. It’s very interesting. Because the flyers were put into public spaces, there was always at least a chance that someone who didn’t even know they wanted to go to a show, would just see the flyer, and maybe they wouldn’t do anything about it then … but it was lodged in their brain because it was interesting and weird. If they were a person already looking beyond what was easily enhanced for them in the media. When you’re sending out an invitation on social media, it’s to people who have basically already said they are interested. There’s something about the way flyers were put up in public spaces; they could affect someone who might decide to come as a result. There’s also something important about the political implications of going to a public space and hanging something up without permission. Cops didn’t really start cracking down on flyering until the 90s here. They would go to venues and hassle the venues about the flyers. Pressuring the venues to give them names of kids in the bands, sometimes show up at their houses and make them take their flyers down. Typical petty authority against really minor trespasses. I definitely see it as a political question of, whose streets are they anyway? They’re public streets. They’re not free of advertising, you just need to have a lot of money to advertise on public streets. It’s an old story. For a long time not a lot of touring bands made it to town. And we kind of had to make our own fun. What else should we know about White Glove Test? It’s worth mentioning that with the flyers, the material itself, I felt really strongly that we should not censor any of it. There are some really objectionable elements to some of the flyers for a variety of people. But I really wanted to tell the story in an honest way, and in an unflinching way. I would have felt like that was false to leave those flyers out. Without making excuses for inexcusable work, we wanted it to be a true record of the time. So it had to include what was occasionally some pretty thoughtless language. At a certain point you’re like, “this was thoughtless then, it’s thoughtless now, do I want to continue providing a platform for thoughtlessness?” But if that was part of the history you also don’t want to give a skewed representation of what was going on. You want people to recognize the thoughtlessness. It’s important to not try to pretend. Louisville is the biggest city in Kentucky. It’s always been a more open-minded place than the rest of the state. Having said that, it’s not as open-minded and never will be as open-minded as other communities on the West or East coast. But the Louisville music community was always a refuge for weirdos and freaks. It’s a real pride for the community. It was super supportive given the circumstances, in a place where you wouldn’t expect to find power and acceptance. The people in the community were all misfits, people who didn’t fit in and felt that family is what you make it, community is what you make it.